Get Fallout Shelter on PC Today! 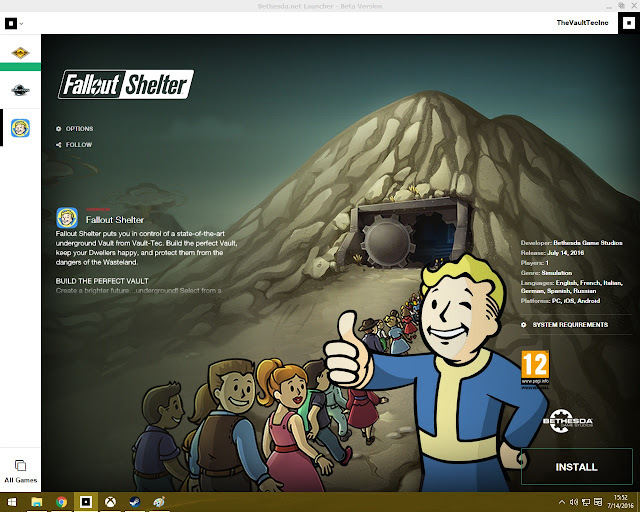 Instead of playing Fallout Shelter on PC via Android emulator, you can now get the official version for PC! The Fallout Shelter PC version and the big mobile update were announced earlier this year, at E3, during the publisher's briefing. So, Fallout Shelter has finally arrived on PC. All you need is Bethesda.Net Launcher. From there, you need to create a Bethesda.net account (if you don't have one already). Once you logged in, two programs are available from the top left of the launcher; the Fallout 4 Creation Kit, and, just below it -- Fallout Shelter. Don't mind my screenshot, showing three programs. Although, the minimum PC specs are as provided above, Fallout Shelter PC version works just fine on some older dual core PCs (I.e. AMD E-300 dual-core @ 1.3 GHz). If you have an old Win 7 64-bit PC, be sure to give Fallout Shelter a try. As our Facebook page fan, Kenny Eisenhower would say -- No lag whatsoever. Thanks for this useful information Kenny, I'm sure many will appreciate it. Fallout Shelter PC version is a free game that also offers microtransactions. If you want to know more about Fallout Shelter, check our Fallout Shelter portal. *UPDATE: you can use your save from Android version of Fallout Shelter. Copy the .sav file from Internal Storage/Android/com.bethsoft.falloutshelter/file/ to My Document/My Games/Fallout Shelter. Thanks to Ananda Krishna, our Facebook page fan for sharing this useful information. 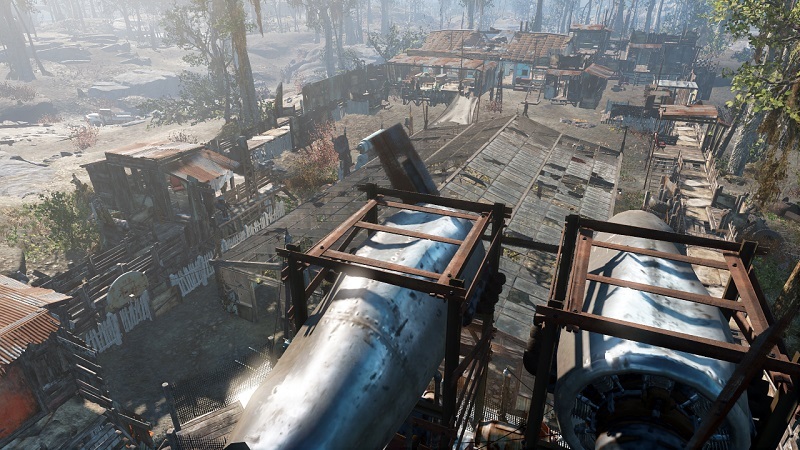 In my previous blog post, Realistic Settlements in Fallout 4, where you can see very detailed settlement builds of Red Rocket Truck Stop and Sanctuary Hills (YouTube links), I already introduced you to what realistic settlements are in my game. A quick reminder of my "problem" with most of the settlement videos over the interweb -- There are many really good videos out there. It's just that most of them are somehow focused on building sizes and wonders, and stuff, rather than being realistic. Mostly, I think about small details like missing pillars on tall buildings or bridges, or even spamming with duplicated fences, floors, etc. I, on the other hand, don't build Commonwealth Wonders or big Palaces, and just want to keep my settlements realistically formed and built, like I would do (if I could) in real life. 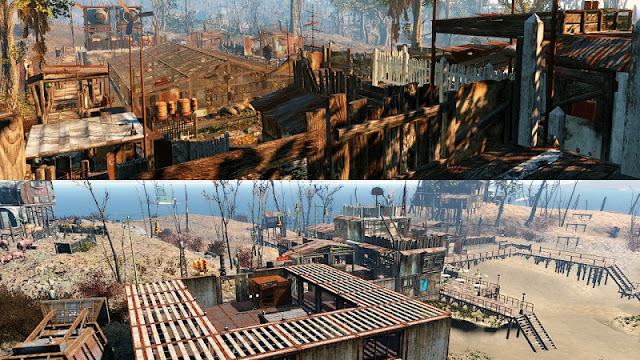 With a post-apocalyptic setting in mind, where building materials are scarce, this time, I'm introducing you the settlements of Greentop Nursery and beautiful Spectacle Island! Before I begin you should know that all my settlements are still works in progress and are about 90-95% complete. I'll start with the Greentop Nursery. I imagined Greentop Nursery being a very important settlement since a greenhouse in wasteland can be a big and important source of food and caps. To protect that sweet jewel of the Commonwealth, I decided to barricade the whole area around it. Since there is not much of a space between the settlement boundaries and the greenhouse, I used every bit of it. I upgraded the original house with a two-story shack on the side and a place where you can eat, have a drink and relax in front of the house. Content © 2015 Vault-Tec Inc. All rights reserved.